Château Trotanoy Pomerol. This famous cru whose name meant in old French "too anoi" or "too boring" (during the work of the earth) is located on one of the best-exposed parts of the famous plateau of Pomerol and was acquired in 1953 by the Establishments Jean-Pierre MOUEIX, since operators. The mix of soils - half of the gravels resting on clay and half deep black clays - on a bed of iron dirt gives the wine both power and depth and a great complexity. The vineyard, partly spared by the frozen drama of 1956, has an average age of 35 years. It is grown in a traditional way (regular plowing, thinning, leafing) and picked up ideally in two or three afternoons. The fermentations take place in cement vats and the young wine is then aged in oak barrels, half of which are renewed each year. 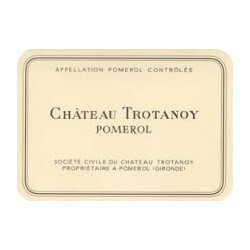 Château TROTANOY is one of the most sought-after wines of the appellation and can be kept for several decades in great vintages.